I lead a missional community of faith in Santa Cruz, CA. I am a husband, dad, musician, speaker, performer, community catalyst and dreamer. Welcome to the conversation. This past Wednesday was my 26th birthday. Since I spent that whole day working, Rachel and I spent Saturday together to celebrate. She took me out to dinner that night at Belmont Brewing Company in Belmont Shore. She treated me to Filet Mignon and man was it good. I love steak! Before that, though, we spent the afternoon at the Long Beach Aquarium. It was my first visit there, and it was really pretty cool to check out all the animals. I have always been kind of fascinated by marine biology I would say. We had a great time checking out sharks, petting sting rays, and even seeing some Hawaiian dancers and stuff who were there for the Pacific Island festival. As we were walking through the tropical fish section, looking at the sea life of Palau, we had the privilege of coming across their biggest tank there just as it was feeding time. If you’ve never been around for that before, the diver in the tank has a microphone and shares all about the fish with the help of a staff member near you as he’s feeding the fish. Tons of fish came out to eat and they were all over the place! Not only that, but it was amazing to see in a matter of minutes how much more vibrant some of the fishes colors were when they were eating. I mean come on! That doesn’t look like an animal! It like a plant with eyes or something! Or Jellyfish. I would look at them in complete amazement as to how their bodies even function. What is so overwhelming is the number of different creatures God came up with. It is a reminder to me of how awesome God is and how much bigger He is than me. 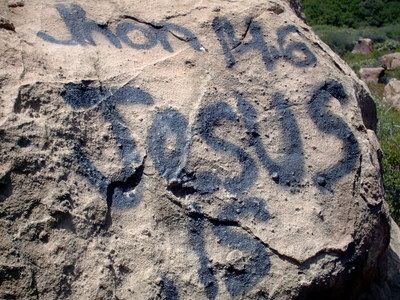 He is so creative and made so many amzing things, yet he chooses to care about us above it all. He gave us a soul and the ability to return love to Him. I love the lyrics to Indescribable by Chris Tomlin. Praise, oh let them praise the name of GOD- He spoke the word, and there they were! He gave his orders, and that’s it! Have you taken time lately to just stop and thank God for all that He created? When I take the time to ponder the scope of all that He is and all that He’s done, I can’t help but be blown away! So this past Friday night, Dave and I got free VIP tickets to see Creation at the Crystal Cathedral. OK, Dave got the invitation and I got to tag along. He wrote on his blog about it, so I’ll fill in a few details from my perspective. As he shared, we spent time talking to a bunch of guys in suits at a reception before going to the Cathedral and having to wait over an hour for the show to start due to “technical difficulties.” Throughout the whole reception, before the show started, and while we were waiting for the computer to be replaced, they talked quite a bit about how amazing the show is. I wasn’t really expecting a whole lot when I went so at this point, I’m thinkin it better be really good the way they talked about it. I think that because I wasn’t expecting a whole lot, that helped me to enjoy it even more. There were parts of the show that were amazing and incredibly professional, and then other parts here and there that were very unprofessional. The most amazing aspect was definately the Cirque Du Sole – esque aerial performers. They did a great job of tying in some really cool acts and they were very well done. Also, as I expected, the lead performers were great. This didn’t suprise me much at all knowing that they hire Equity performers. They also used lots of large scale animal puppets – kind of Lion King – esque. Most of those were pretty cool looking. They had one OK one that was a T-rex, which was kind of cool, but didn’t look so good when it went extinct. I’m sure that’s something they’ll tighten up in the nights to come. That was one theological point that I disagreed with in the show. They inferred the creation of Dinasaurs and then their extinction followed by the rest of the animals afterwards. Personally, I would hold to a more traditional view of creation with the days in Genesis being literal 24 hour periods and puting dinosaurs on the Earth at the same time as man. Of course I recognize that they did a lot of research in creating this show, and I’m sure there are Christian scholars who hold to their interpretations. I just tend to agree with the others. Overall it was a well done production, especially for a church, even if it is Crystal Cathedral. I’m still not sure whether or not I think it is worth the amount it costs to go, but if you are able to fork out the cash and go, it will definately be an entertaining evening. They did a great job at really engaging all your senses in the production and at least got you thinking a little. Anyone looking for an apartment in Long Beach? Do you know anyone looking for an apartment in Long beach? If so there is a two bedroom condo for rent directly 2 floors above me on Pacific and 7th. It will be available July 1st. Email me if you want some info. You can just walk down a few flights of stairs every Tuesday night and join us for life group! Last night I hung out with 13 other people from Revolution (actually one was from another church) at the home of Darrenn and Jenny Platt. It was for an event we’ve been doing called “Going Deeper.” It really hasn’t been a very highly planned and programed event like many at Revolution. We really just spread the word that it will be a night of home based worship and prayer. So that’s what we did last night. Christian came over with his djembe and we just worshipped Jesus through songs, prayed, and took time to listen for His voice. It was such an awesome night! I wish I did stuff like this more often with people. It is always such a refreshing time and I just love worshipping God with friends in a relaxed, casual setting. No set list. No planned agenda. Just start singing and let God lead the way. My prayer for Revolution church is that more and more people would long for times of intimate worship with Jesus and create atmosphere’s like this on a regular basis. That more and more people would show up at these night in a desire to know God better. For me it was a much needed night of filling from God’s spirit. Afterwards, my wife and I hung out for a while to watch the season finale of Survivor. I know, not connected at all to worship and prayer, but we had a blast watching with Dave, the Platt’s, and some of their friends. I was pulling for Ian, but oh well. Tom’s cool too. Tonight my wife and I went out with Keith and Liana Dickson to a program called Humankind at ROCKharbor church in Costa Mesa. I believe in the past it has actually been titled “Shimmer.” It was put on by the creative arts folk there and a theater company they have called three trees. It is basically a night of all sorts of arts – music, visual, dance, drama, poetry – all centered around one common theme. This time, the night was designed to cause us to think about community and to “remind you of the person across the street, across the world or sitting right next to you.” Here were some of the highlights from my experience. The night opened with some awesome music by Tifah Al-Attas from Revolution church. Of course part of the reason we went was to support her and she was amazing as usual. Probably the strongest component of the night were the dramas I thought. Specifically, there was a hilarious yet pretty convicting monologue performed by Shannon Cobb titled Looking For Friends In All The Wrong Places. It pretty much showed how ridiculous our personal relationships with our television can be, and the substitute that many people use it for instead of true personal connection. The other great drama was a recurring role by Chad Halliburton titled Mirror. It was done in three parts all pulled from the book Blue Like Jazz by Donald Miller. Wow! Definately the most thought provoking material for me and really well delivered by Chad. I was recently given this book by Dave and I am even more interested to read that book after tonight. The other aspect of the evening that I found impactful was video. There were three videos during the evening, all of them very well done. My favorite was probably when two girls sang For Good from the musical Wicked by Stephen Schwartz while a video played with footage from ROCKharbors most recent trip to India. It was pretty fun to see some folks from our church who went with them up there on the screen. But beyond that, the music and the video together were really powerful and emotional. Overall, the night was just really well done and really caused myself and others I was with to think. One thing that kinda surprised me a bit was the number of people who were there. I’m not really good with numbers, but I’m thinking there probably weren’t more than 150 people there. Not a bad turnout, but they are a large church and having visited their service last Saturday night I know they advertised it quite a bit. I don’t know how many were there the night before but I wish more people would have been there to experience it. It also caused me to think about our church and my desire to do something similar. I wonder what the turnout would be like for a smaller community such as ours. Above all, when I look at this evening from a ministry perspective, I am just reminded once again what an incredible vehicle the arts can be to provoke thought and share a message of hope with our culture. It is such a strong passion of mine and I believe a somewhat untapped medium in so many ways. I truly desire to use all of the arts more and more as we continue to comunicate the Gospel to our culture in a language that they understand. For me, music and theater have always made a deep impact on my life and I love using those things to impact others in such a positive way. Congratulations to everyone involved with Humankind for presnting a great overall package. Keep up the good work! 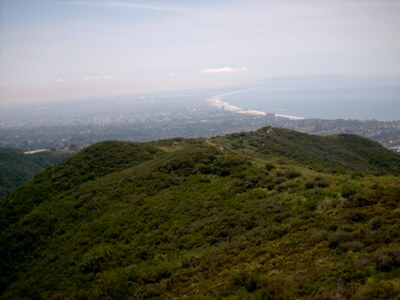 up near Santa Monica. 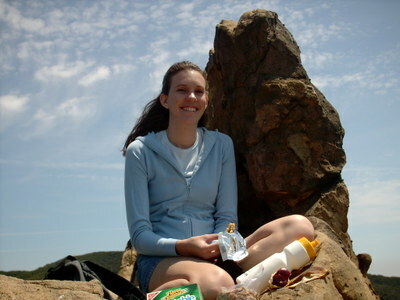 We had a grat view with lunch as we sat on a big rock at the top of the hike. As you can see below, I got a laugh out of a message left by a well meaning Christian who apparently couldn’t spell so well. I still haven’t been able to find Jhon in my Bible. Anyone else have it? Before joining the team at Revolution, I was part of a small church plant called Kol Church which was led by Boomer Reiff with Brian Yoshida and Paul Taylor. Yesterday was their last day meeting as a church. All of them will now look to get plugged in at other communities. This event didn’t come as a huge surprise, but I have recognized that there is still some grieving that I do as a result. I had lots of really awesome times there and it really is sad for me to see it gone. Of course I am sttill in touch with many of those people and I plan to stay that way. The church was started on Easter of 2003, and while it lasted only a couple years, God used it tremendously to do lots of great things. I was able to see multiple people come to Christ and truly deepen in their faith in the time I was there. I met some amazing people who have changed my life. I saw multiple people who had been involved in the ministry even before it became it’s own church be raised up by God and move off into other bodies to serve in leadership capacities. And I know that I grew a ton while I was there, too. I grew so much closer to Christ during that time and learned a lot from the leadership there. To this day, Boomer’s vision has significantly shaped much of my vision and ministry passion for my future and I am incredibly thankful for him. I believe that he is an amazing visionary with awesome dreams and I look forward to seeing God to continue to do great things through him. It is sad anytime a church plant comes to an end. My heart goes out to their community, and I just thank God that Kol Church existed for the time that it did. It was a real long night without much sleep last night, and I think I’m still trying to process everything that happened in the past 24 hours. Rachel and I were woken up at about 12:30 a.m. to the sound of a loud bang. I decided to step out on the balcony to see if it actually was anything when I saw a major accident right on our corner. I called 911 who already had people on the way. After hanging up, Rachel noticed that my Jeep which I had parked on the street just a few hours earlier was up on the curb. 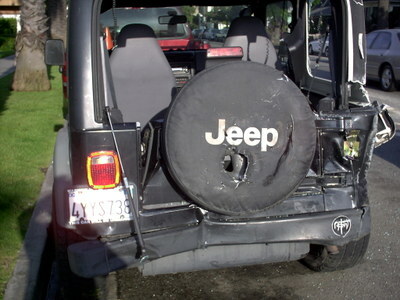 I threw on some clothes and went downstairs to find out what had happened and what I needed to do about my Jeep. I was not close to prepared for what I found. I will spare the details cause they’re pretty unpleasant, but it was a really bad scene. It was clear from the things I saw that someone hadn’t made it through the accident, and it was a lot harder to stomach than I could have ever imagined. I gave the cops my info and got out of their way and went back upstairs to Rachel. 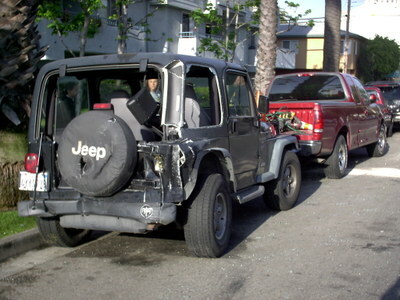 All of a sudden my Jeep wasn’t the least bit important. In light of everything that we knew was going on downstairs, there was a lot to talk about and process together. It was so evident to me last night just how fragile life is. It is so short and we never know when that last moment may be coming. We took time to pray for those involved, for the families of those involved and for the police officers and fire fighters who have to see this kind of thing on a daily basis. It’s so scary at times to think about how quickly, easily, and unexpectedly something like that can happen. I just know that I was deeply effected by the things that I saw last night. God is so good and I am so blessed to have all that he’s given me. 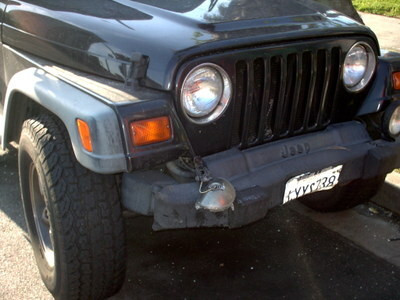 This morning I was able to visit my Jeep to survey the damage more thouroughly. Below are some pictures I took of it. Needless to say, (but I will), it was pretty jacked up. It was actually shoved about 8 feet forward and hit the truck in front of it which hit the truck in front of it which hit the SUV in front of it which tapped the car in front of it. I took it in to the shop today and they told me it is definitley going to be totaled. While I have to admit I am pretty bummed about losing the Jeep, I also have to admit that I am just very thankful that Rachel and/or I were not in it. So, I guess it’s time for the car hunt to begin. Any suggestions? I don’t think Rachel wants another Jeep, and it’s probably not the wisest gas wise either. All in all, it was a pretty sobering experience. It was a great reminder to me to just be thankful for every moment I have with those I love, and really to make the most of the time I have in giving back to God. Please keep it on your heart to pray for the family of the person in the passenger seat who lost his life as well as for the drivers of both cars who made it out ok. So last night I had the opportunity to get together with a bunch of my old friends to just hang out and worship God together. My friend Daun is heading back to Australia for another 6 months after being there for the past year, and she got us all together before she flew out this morning. These were all people who I used to do church and life with. So many times we would go out and have fun and the night would end up back in someone’s living room and Izak leading us in worship with his guitar. Those were some of the best times of worship that I ever experienced. It was during that stage of my journey that I most felt God’s romancing and wooing. It’s something that I long to see happen more in our community at Revolution. Times of getting together to worship because that’s just who we are and what we love to do. No script, no plans, just time to let God lead. It was so awesome to be able to revisit that with old friends last night. Some of them I had not seen in 1 -2 years easily. It’s amazing how when people make such an impact on my life, I can not see them for so long yet still feel so close to them when we reconnect. It was amazing to see how God had taken so much of our group in so many diferent directions. Out of the nine of us who gathered to worship, we represented 6 different churches. It’s great to see how God raised us all up and then sent us out to make a difference in so many different places in so many different ways. All together, it was just a great night of hanging with friends and hanging with God. It always means a lot to me to be able to catch up on old relationships and focus on God in the process. Like I said, it’s something I feel God’s definitely challenging me to do more of with the people I’m in community with now. One chance to do that will be May 15th when we have another night og “Going Deeper.” This is something we’ve done a couple times to just spend a few hours in prayer and worship. Hope to see lot’s of Revolution faces there. You gotta here what this 911 operator said to a mom who called in. Given I’m not sure why she would’ve called 911 when she was having behavioral problems with her kids, it still probably wasn’t the brightest way for the operator to respond. Check it out below.